Time cards have been a symbol of manufacturing productive efficiency for years. I think we have all seen images of production and manufacturing associates dutifully standing in line to “punch in” at their appointed shift on the time clock. It seemed to be a marvelous mechanism to maintain, measure and direct those resources associated with production, in the most efficient manner. It is where the phrase “on the clock” originated. You came in and they started paying you when you “clocked in” and they stopped paying you when you “clocked out”. It was efficient. By the way, the “Time Clock” that has become so universal when talking about clocking in and clocking out, first made its appearance on the business scene in the late nineteenth century. So, why am I talking about one hundred and thirty year old inventions (Time Clocks) and eighty year old employee definitions (Fair Labor Standards Act)? The reason is pretty simple. As the production and standardization processes that have been used in manufacturing have found their ways into the other disciplines and aspects of business, so has the cost tracking and charging of those resources responsible for doing the manufacturing. We are now asking our exempt employees to fill out time cards associated with the work they are doing. This in and of itself is probably not a bad thing, however it engenders a new and different behavior in the exempt employee. It is this new “Time Card” behavior in exempt employees that can a detrimental effect on the business. 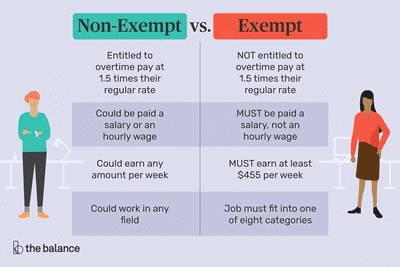 For lack of a better definition, exempt employees are paid by the “job” as opposed to by the “hour”. If an exempt employee must work late hours and weekends to complete their assignment, they do not get paid any more. They do however get the satisfaction of knowing the completed their task, regardless of how long it took them. The idea of having exempt / salaried employees track their time, was to better associate costs directly with specific projects or activities. This association gave rise to the exempt employees who could directly associate their activities with specific items or revenue producing functions, and those that could not associate their work with specific items. Those that could be directly associated with specific products, projects and functions were called “Direct” labor, and those that could not be directly associated were called “Indirect” labor. 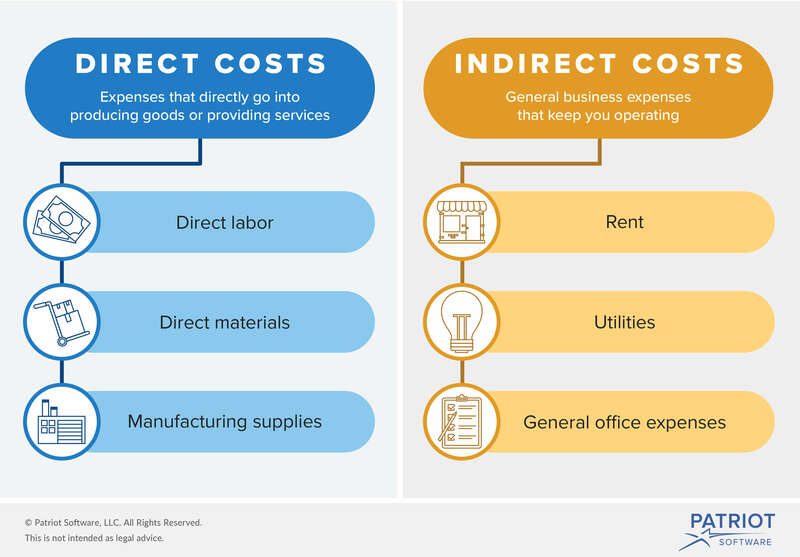 “The essential difference between direct costs and indirect costs is that only direct costs can be traced to specific cost objects. A cost object is something for which a cost is compiled, such as a product, service, customer, project, or activity. These costs are usually only classified as direct or indirect costs if they are for production activities, not for administrative activities (which are considered period costs). The following as a good way to think about this. I promise I will get to my point about Time Cards and why this is important soon. So, all of this work associated with slicing and dicing the time that salaried employees spend on their various activities is being done to understand what portion of their work can be directly associated with a cost object (Direct) and what portion cannot (Indirect). Why is this important anyway? It’s pretty simple. All businesses want to reduce, minimize and otherwise exit overhead or indirect costs from the business equation. Every business has the objective of reducing indirect costs, otherwise known as “Overhead”. As noted, these are the costs that cannot be directly associated with revenue production. So, when Exempt, salaried employees are asked to fill out time cards, and they have multiple options, both “Direct” and “Indirect” to associate their time with, which are they going to choose? Knowing the corporate desire to minimize, reduce and exit Indirect and overhead costs from the business, they will naturally migrate their time charging to “Direct” functions and charges. On the surface this might seem like a wonderful way for companies to reduce overhead, and in some instances, it will work. However, if you have the financial responsibility for one of these cost objects, you will want to be able to closely monitor the number of people and the amount they can charge to your cost object. This monitoring, or policing activity and capability again creates an incremental overhead. It is essentially a transference of the overhead responsibility from the labor pool owner (of salaried, exempt employees), to the Cost Object owner. Labor pool owners are always going to try and minimize the amount of their labor that is not directly associated with a revenue producing cost object. They will want to show the preponderance of their time, as reported by time cards, as being directly associated with a revenue producing function. Engineering groups, development groups, support groups and just about every other group will begin to display this behavior once time cards are utilized in this fashion. The fear for them is that if they show too much time spent on overhead functions, they will be subject to a cost reduction activity in an effort to reduce overhead. With the pressure to be associated with, and charge to only Direct costs, the direct costs associated with specific cost objects can become inflated by excessive charging. Since direct costs are “above the line” in accounting and margin terms, this could result in inflated and non-competitive prices. There will now be a somewhat adversarial relationship in place between those groups wanting to charge directly to cost objects, and those groups that are responsible for maintaining those cost object budgets, and the corporate inefficiencies and friction that this creates. There is also the non-productive time that will be spent challenging, changing and rectifying those charges as they come in. There is non-productive time, effort and cost for increasingly capable corporate tools to maintain, monitor and control this type of charging effort. How do you control who should and should not charge to a cost object? Time cards, like process can be a good thing. But like process, they should not be viewed as a replacement for judgement. When you move costs associated with time cards from indirect labor to direct labor, it may solve a corporate desire to reduce perceived overhead and indirect labor expenses, but it also creates several new issues and expenses associated with monitoring and controlling those charges. 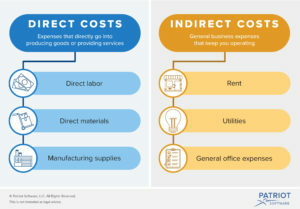 Due to how costs are accounted for in direct versus overhead items, it can also change both the cost profiles, margins and ultimately pricing profiles in the market. Time cards in the salaried or exempt employee environment can and will change behaviors. Labor resource groups will increase their focus on having cost objects to charge to as opposed to understanding that there is to be expected a certain amount of slack time that they will have. Instead of the labor resource pool manager managing this slack level, time cards in essence transfer this issue to the cost object owners to try and control and manage. Time cards for salaried and exempt employees can provide a better level of visibility into how time is spent and what employees are working on. It does however carry with it what is known as “The Observer Effect”. I always try to sneak a little physics into any discussion. As long as business is aware of how behaviors are changed, and what may need to be done to compensate for these changes, there can be value in them. However, without those considerations they can create an entire new set of issues for a business to deal with, and may result in little to no efficiency gains. Usually I start off one of these articles with a specific idea in mind. I try to examine a topic or a specific facet of business that I find interesting and provide my take on it. I end up trying to make a point or infer a position, and I also try to make it a little entertaining, at least to myself. I have been told on multiple occasions that it is not uncommon for me to miss that entertaining objective for others. Today I am thinking I might change things up and try a little different approach to things. None of the topics running through my mind really seem worthy of their own entire article. However there doesn’t seem to be a way to banish them from my thought process in favor of a perceptibly higher priority topic. They continue to pop up and present themselves in various forms, apparently clamoring for my attention. It appears that the only solution is to run through them all and let them be sorted out on their own. Is it just me or does anyone else notice a perceptible drop in attendance at the office on Fridays? I understand all that has been written about the benefits of flexible hours and virtual offices and the like. If that was truly the cause of this phenomenon I would expect a little more even distribution of lower office attendance days across the rest of the work week. I have seen the new television commercial where the “boss” proclaims much to everyone’s amusement that “Wednesday is the new Thursday”. That’s fine, but I definitely must have missed the memo where Friday has become the new Saturday. On a related topic, I don’t seem to have much sympathy either for those who are ever more frequently complaining about having to attend calls or meetings on Friday afternoons. The last time I checked Friday was still part of what has been so quaintly and colloquially referred to as the “work week”. You know, that eight to five, Monday through Friday thing? This is especially interesting to me since the latest information from Gallup.com is that the average work week is no longer forty hours, but closer to forty seven hours. That would mean that instead of just working eight to five Monday through Friday people are on average also working eight to four on Saturdays. So I guess the conundrum to solve here is that people are working more hours and the business offices have lower attendance on Fridays. With all the additional hours being worked I am not so sure that more is actually being accomplished. Interesting. Maybe this one does deserve more thought and research. I’ll have to think about it. I passed a milestone a little while ago. 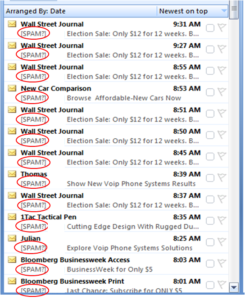 I am now averaging more than two hundred spam emails a day on my corporate email account. That is correct. Across a typical eight hour day I am now receiving a spam email every two and a half minutes. I must really be popular with the spammers. I don’t know why. I never respond regardless of how tempting they tell me their offer is. 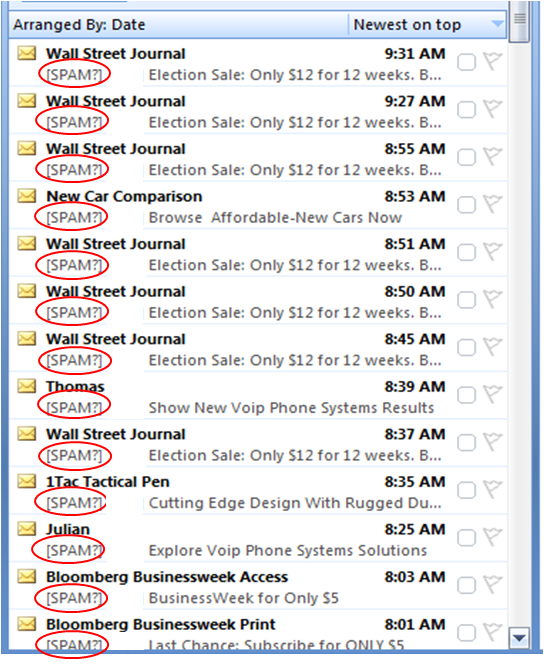 What is a little more than disconcerting to me is that both my email system and my computer recognize that the junk emails are spam, and regardless of what setting I use to try and stem the ever increasing flow, nothing seems to work. If the system knows that they are spam emails, why doesn’t it just get rid of them, or better yet, block them from even being presented. This number does not include the approximately fifteen other emails that did go directly to my junk email folder because I had already individually blocked the sender of previous spam emails. “The real origin of the term comes from a 1970 Monty Python’s Flying Circus skit. In this skit, all the restaurant’s menu items devolve into SPAM. When the waitress repeats the word SPAM, a group of Vikings in the corner sing “SPAM, SPAM, SPAM, SPAM, SPAM, SPAM, SPAM, SPAM, lovely SPAM! Wonderful SPAM!” drowning out other conversation, until they are finally told to shut it. “Drowning out all other conversation…” That sounds about right. As if spam emails are not enough, it seems I am now getting more and more spam phone calls as well. They are coming in on both my personal as well as business phones. These calls seem to have also spiked in frequency most recently. I initially tried to be polite when I told them that I wasn’t interested in whatever it was that they were sure that I wanted to talk about. They just kept going on with their spiel. I would then be forced to hang up anyway. I then tried being a little more “forceful” in communicating my desire that they should never contemplate calling me again. Despite my directly questioning their intellects and species orientation, this didn’t seem to work either. I have settled on what I think is a good solution to this particular business problem. When I receive a spam call, I simply answer the call, lay the receiver down and go on doing whatever it was that I was doing when the call interrupted me. The auto dialing system then connects the call to a person on the other end and I can eventually hear someone start speaking, and then realize that no one is listening. Eventually they hang up and go away. Since these auto dialing spam phone call shops are predicated on the efficiency of the system, this method disrupts their entire process. I think that they then put me on some sort of a “do not call” list as the number of repeat offender calls from these places seems to be reducing. The only problem is that there seem to be so many new ones popping up to take their places. I don’t want this to seem like some sort of scree or disconnected rant today. Business is obviously changing. How people work, where they work and what they do has changed. I have noted in the past that I am not so sure in many instances if these changes have been for the better. Working more hours from a virtual office, does not in itself indicate any sort of an improvement to me. It does however seem to be instrumental in generating what is now a forty seven hour work week. I am not sure what the business benefit of generating spam is. I guess it can be considered the electronic replacement for Direct Mail Direct Response (DMDR) marketing and since there is now no cost for postage it seems to be running amok. I don’t think I have ever seen or heard of anyone responding to that stuff although a DMDR response of one to two percent was the expected target. I guess the logic is that if the volume of junk mail is increase by an order of magnitude then the response will increase proportionately as well. Still, sending me ten requests for the thing I didn’t want once isn’t going to improve things. Generating spam of any kind should be a punishable offense, at least in my opinion. Living in Texas the idea of dragging spammers through cactus or horse whipping immediately comes to mind as a suitable punishment. No need to get too medieval on them, at least for the initial offense. I think that’s enough disparate business topics for this session. I’m sure I’ll have more to discuss in the future. Wow, was it just me or did the last year and a fair chunk of the first month of this year just fly by? According to Einstein time is supposed to slow down the faster you go, but that doesn’t seem to be the case in business. It seems that the faster I try to go the faster time tries to go too. It’s interesting how in just about any race with time, time has a tendency to win. Go figure. I think I may have touched on this topic in the past, but since we are at the relative start of a new year, I think I’ll spend a little more time on it. As we start out on a new year with new opportunities, new goals and new hope, we cannot forget that we must also reflect on the past year. This reflection is normally referred to as an annual review. Depending on how you did last year this reflection can either be a pleasant or unpleasant experience. I think most of mine for the most part have been reasonably pleasant experiences. I think that is because a learned early on the difference between work and effort. I have mentioned in the past that I have an affinity for physics. This seems to serve me in good stead when my son brings home his high school physics assignments such as building a bridge out of paper or trying to construct a capability to disperse the force of a mass rolling down an incline plane. It’s kind of cool to be a go-to guy for your son. I just hope I got the equations right. I also find that sometimes it relates directly to business as well. To a physicist work is done when a force that is applied to an object which moves that object. The work is calculated by multiplying the force by the amount of movement of an object (W = F x d). In this example “Work” would equate to the goal that was set for the individual or business at the beginning of the year, “Force” is the equivalent effort that someone expends in the pursuit of that goal and “d”, the movement is the equivalent of an almost unknown item which I’ll call an efficiency or “success rate”. So for business the equation for work would be Work = Effort x Success Rate, or W = E x SR.
What this means is that the effort expended and the achievement of the goal may or may not be positively linked. This would explain why some goals would seem to be easily attained with apparently little effort and some goals may be unobtainable regardless of the amount of effort expended. This is something of a roundabout way of saying that just because you worked hard last year; it doesn’t mean you are entitled to a good year end review. Everybody works hard these days. The exception might be “Wally” in the Dilbert comic strip (by Scott Adams), but by and large everyone puts forth the effort. Even Wally puts forth an effort in his quest to avoid work. Effort is good, but it is at this point table stakes. “Work” as it is defined in the annual review is the measurement of the achievement that they effort generated. If you are in sales and you have a quota that means you have a numerical target, such as orders. You can put forth a great deal of effort but unless you actually get some orders, according to your compensation plan (and probably your sales manager) you didn’t really accomplish anything. So by these measurement criteria you in fact did no work. Catch the difference here? Lots of effort does not mean you did any work. I purposely try to create primarily quantitative objectives and goals for my teams. There will always be a certain amount of qualitative acknowledgement associated with them, but for the most part I want them to be numerical, and measurable in nature. By doing this you remove a great deal of the effort versus work type of discussion. In business we keep score via the financial numbers. If you can’t create objectives and goals for any of the business functions that you may have, that somehow relate to or distill down to these types of financial numbers, then I might suggest that a review of the necessity of the function being measured might be in order. Again to simplify things: If you can’t create a viable metric for a function that relates to the achievement of one of the financial goals, you had better look at the viability of the function, goal and metric. Numbers are finite. We all seemed to get a working knowledge of numbers dating back to approximately the second grade. We all know when one number is either larger or smaller than another number. It is usually not open to much interpretation. This concept usually leads to readily acknowledgeable annual reviews, regardless of the performance level. Too many times we create “soft” goals that are somewhat open to management as well as staff interpretation. Any time there is an open interpretation of an objective you can be reasonably assured that there will be different interpretations of the achievement of the objective. This is the essence of the effort versus work example. Non-quantifiable goals invite an effort based annual review. Quantifiable goals invite a work based review. Effort based reviews can lead to a basic inequality of reviews across an entire team. Instead of measuring progress and achievement you are instead measuring activity. Activity and progress are as different as effort and work. It is as different as splashing around in a pool (activity), and actually swimming across it (progress). We all know that is possible to appear busy without actually accomplishing anything. In looking back at the last year, and at last year’s goals it may be difficult to implement a quantifiable measurement scale, if the goals were not originally established with such a scale in mind. However, the other aspect of the early part of the year is that in addition to reviewing last year’s performance, it is the time and opportunity to set the goals and objectives for the coming year. The beginning of the year provides leaders with the opportunity to modify the goals and objectives as well as the measurement scales and criteria so that they can be quantitatively based. By doing so the leader enables the team to focus on progress and achievement as opposed to activity, and work as opposed to effort. It enables the team to understand and make the distinction associated with knowing if they are doing something that will ultimately contribute to achieving an objective or if they are doing something that just keeps them busy. The key point here is that when it comes time to review this year’s performance at the beginning of next year it would be to the benefit of all members of the team to have defined quantifiably goals, and a known scale by which they will be measured. It makes this time of the year a little easier for everyone involved. Do customers really care what it costs a company to provide a good or service to them? We have all heard that the vendor – customer relationship is supposed to be more like a partnership these days, but does it really? How much more would a customer be willing to pay to have that partnership? Do we really care what the cost of the car is that we decide to buy, and by extension how much that automobile manufacturer makes on each car we buy? I don’t think so. Do we really want to have a “partnership” with that automotive manufacturer, or do we just want to buy a car? I think people, and companies are more concerned about the price they pay and the value they receive for the good or service, more so than the cost the provider bears to provide the good or service. I think this is a pretty interesting distinction. Customers are concerned with a supplier’s price, not with the supplier’s costs. Customers are concerned with the value they perceive they will get from the good or service, not the profit (or possibly lack thereof) that the supplier will recognize from the sale. In short, costs and associated profitability are an internal supplier issue, and prices are an external customer issue. In short it seems that it is the customer’s decision on whether or not they make the purchase decision, and it is the supplier’s decision on whether or not they stay in business. I will look at a couple of examples to illustrate this point. People do not seem to care how much Apple makes on its iPhones or Macs or any of its other products. Apple is hugely profitable. They make an incredible amount of money on every product unit they sell, yet every year we see people line up (or even more unexplainably, camp out) in order to get the next new iteration of Apple’s products. They willingly spend the money. They don’t care how much Apple is making. They perceive the value and make the purchase. And every year Apple creates a new iteration of the product to feed this cycle. On the other end of the spectrum, people did not perceive the value proposition of the products being produced by Studebaker, American Motors, Chrysler and General Motors at various times in the past. They didn’t care that these companies were not making enough margin on their products to remain in business. They did not like the designs, the quality or the prices enough to pay what the manufacturers needed to stay in business. Studebaker and American motors are long gone. Chrysler and General Motors would also have departed were it not for governmental intervention. Economics teaches that the market sets the relative price for all readily substitutable goods and services. This price point is usually referred to as the intersection of the “supply” and “demand” curves. Unless you can influence or control the supply curve, you are pretty much at the mercy of the market when it comes to the price of the good or service. Aha! You should be pointing to the fact that Apple does not control the supply of smart phones into the mobile phone market. As such, how can they set their price so high and make so much money? The answer here is that Apple does not in fact control the mobile smart phone market. Apple controls the supply of iPhones in the mobile smart phone market, and it has been shown that more than forty two percent of people buying smart phones want an iPhone. While other manufacturers might like to try and convince the market that their product is a readily substitutable alternative to the iPhone, it looks like they have not been entirely successful there. While on the other side of the example, it has been shown that one manufacturer’s car can be substituted for another’s. We have seen this in the branding and segmenting that goes on in the automobile market. Segmenting is a process where a very large market is in essence broken down into several smaller market segments. That is why we have “economy” cars all the way up market to “luxury” cars. It may not be logical to expect that a Hyundai is readily substitutable for a Mercedes-Benz, but it could be expected that a BMW, Audi or possibly a Cadillac, could suffice. It has been shown that there are certain brand loyalties in the various automotive segments, but as market trends, automotive designs and prices move, these can be overcome and new loyalties established. However the point remains the same. Customers are not so much concerned with the cost of the Hyundai, Mercedes, BMW, Audi or Cadillac. They are concerned with the price. And even more specifically the relative price and the relative perceived value. A person looking for a “luxury” car could buy a cheaper “economy” car for a lower price, but would not receive the perceived value they want. Conversely an economy car patron might want a luxury car, but can’t afford it. If customers do not care what the supplier’s cost for a good or service is, why do so many suppliers create their customer market pricing based on their internal costs associated with their good or service? This is known as “Cost Plus” pricing. If it is the market price, or the relative competitive market price that is of primary concern to a customer, why would a supplier base their prices on their costs, which are irrelevant to the market? If you are a low cost supplier and use this method you could undershoot the competitive market price and forego significant revenue and margin. You can bet that Apple did not make this mistake, judging by their revenues and earnings reports. They saw the price the market would bear and adjusted their price upwards accordingly. They are letting the other suppliers try to compete on price. On the other hand, if you are not the low cost supplier, but rather a less efficient higher cost supplier, basing your prices on your costs could bring you in well above the market price. While Apple may be able to sell its products at a premium, I’m not aware of too many other suppliers that enjoy a similar market position. You can ask the extinct Studebaker or American Motors how that higher cost versus the market price thing worked out for them. I guess Oracle might be another company that tries and somewhat succeeds it setting its own market price. Larry Ellison, the CEO at Oracle has always done things his own way. But then again, he likes to build yachts to race in the America’s Cup (a really expensive pastime) and he does own his own Hawaiian island (Lanai) so he must have figured something out. The major difference between Apple and Oracle is that I am not aware of anybody that “likes” Oracle the way the like Apple (they are rarely, if ever mentioned in the same breath), and I have never seen anyone line up in the street to be the first to buy the latest iteration of Oracle’s database systems and applications. “Cost plus” pricing assumes that a supplier has a competitively based cost structure. This may or may not be the case. Regardless, the market doesn’t really care. What the market (and the associated specific customers) cares about is the price and the relative perceived value that is derived from the good or service. Those goods and services where there is a perceived high value and not a readily substitutable alternative can and do charge a premium in the market regardless of their cost structures. Those goods and services where there is a perceived readily substitutable alternative, regardless of the market value, can only command the market price, also regardless of their cost structures. It seems that the only times that cost plus pricing can be used is if the supplier has a competitive cost structure (which will be difficult to ascertain since suppliers rarely share such information), or if the supplier controls the supply of the desired good or service, in which case the supplier can price in any manner they choose include cost plus methods. In most other cases suppliers need to be cognizant of the prevailing market prices and trends, and strive to keep their costs reduced so as to retain their profitability at those market pricing levels. It’s that time of year again. Spring is in the air. Birds are beginning to sing. Bees are beginning to buzz. It’s that time of the year when everyone’s thoughts turn to their favorite topic. It is the topic that they have actually been thinking about all winter. Yes, you are correct. It is time for the annual bonuses to be calculated. People who are not fortunate enough to be sales people and on a direct sales commission plan, are usually on some sort of an annual management bonus plan. This plan can be complex or simple. It can have multiple factors associated with it, or possibly just a few. It is in essence a methodology for those that are not associated with direct sales to be able to either positively or negatively participate in the performance of the business or organization. The simpler the compensation plan the better, for all involved. It doesn’t matter if it is a commission plan based on orders for a direct sales person, or a management performance bonus based on the attainment of specific goals. The simpler the better. We need to remember that simple does not mean “easy”. Simple means that there are specific defined objectives and directly correlated rewards associated with obtaining those objectives. It has been my experience that selecting the appropriate goals and objectives that drive the desired behaviors and performance is not an easy task. Sales commission plans are in general a little bit easier to figure out than are management incentive plans. There are usually some very specific and well defined numbers associated with the desired goals. These can include items such as orders, revenues and margins. The numbers achieved are divided by the goals and the performance percentage is hard to argue with and is well understood. Management performance goals are a little bit trickier. The further into the organization away from senior management that you go, the smaller that individual’s ability to affect corporate performance. Based on this fact you would think that actual corporate performance should not have a great deal of affect on the majority of management incentive receivers. On the other hand everyone is contributing to the organizations performance. If the overall organization does not achieve its objectives and goals, it is difficult if not problematic to provide a management bonus to the individual team members. However, it should also be noted that most sales people do in fact receive some portion of their commission structure rewards at performance levels that are less than one hundred percent achievement of their targets. It would not be difficult to accept the need to provide some sort of similar type management reward for partial goal attainment that works along those same lines. The point behind all this stage setting is pretty simple. Notice how everything I have discussed up to now is based on the measured attainment of specific defined objectives. When you attain them you get paid and when you don’t attain them you don’t get paid. It should be a well understood arrangement for all involved. As an example I will hearken back to a simpler time. A time when we were in school. A time when we did our school work and we got grades. We should all remember that time. Depending on where you went to school, a passing grade could either be a “D” or a “C”. I will note as an aside that neither of these letters were acceptable when it came time for my parents to review my report card. There were no acceptable excuses. It’s funny, but I sometimes hear the same words when speaking to my children regarding their scholastic performance. I wonder where they are coming from. In any event, a certain numeric percentage of the available one hundred percent were assigned to these grades. That meant that regardless of how hard you may have worked, if you didn’t achieve the sixty or seventy percent threshold, you failed to achieve your objective and received no credit for the course. This was a given. It is not unreasonable to expect any commission or bonus plan to also employ certain threshold before any compensation occurs. Just to be clear, if commissions and bonuses are based on the achieving of specific goals, it should be expected that a certain threshold will need to be attained before any commission or bonus is paid. Below the threshold, regardless of how hard the individual works, nothing will be paid. Many organizations follow this policy. There are also those that do not. It is best to be aware of the policy when either setting or participating in a compensation structure. I have been in several organizations in the past where individuals have commented that they worked incredibly hard in the previous year, and that they were hoping for a good compensation check. I couldn’t help but look at these people with awe. I would always ask if they were aware of the specifics regarding the commission plan or the management bonus plan. They would say “yes”. I would ask if there was anything so qualitative (as opposed to quantitative) about their percentage attainment of their goals that would make it difficult for them to measure how they performed against their goals. They would say “no”. I would then ask how they could expect anything but the correctly calculated amount. They would then again reiterate how hard they worked. I would then inform them that what they were expecting was not a calculated performance bonus, but a “tip” similar to that which is provided to someone who provides a personal service. Much like the wait-person that brings the food, but must suffer due to the poor performance of the kitchen, or the cab driver that must deal with unexpected traffic when the ride is in a hurry. They performed their work as well as could be hoped for, and even though the objectives of a hot and timely meal, or arriving in time to catch a flight were not achieved, quite possibly to factors outside of their control, they would still expect a tip for the service they rendered, especially if they worked hard. I would then inform these people that to my knowledge most organizations do not participate in the practice of “tipping”. They pay for achievement. People need to know that going in. I think that for all of us hard work is a given and is expected. A bonus is just that. Something extra that is predicated on the measurable performance and achievement against defined goals and objectives. It may take hard work to achieve the goals and earn a bonus. But in business if you don’t achieve your objectives you usually won’t get a “tip” just because you worked hard. We all know that senior management likes to see a sales volume graph that is a smooth line sloping upwards from the lower left of the chart to the upper right. If the economy and the market are growing and the customer demand grows along with the economy and the competitors don’t change their product’s or price and the government does not change any of it regulations and none of the multitude of other demand affecting factors changes, it is possible that this utopian state can exist…for a little while. However any unanticipated change in any of the listed (or any of the large number of unlisted factors) can and will change the profile of the slope from its desired direction. Senior management must then lead and decide if the change is just a normal process within the market cycle, an aberration in an otherwise stable situation, or a longer term portent of an ongoing decline. As with most management decisions and strategies, only time will tell. If time shows that it is indeed either a part of the normal market cycle or an aberration in an otherwise stable market, then there is no problem. Sales improvement can and will continue. On the other hand, if sales do not improve and the downturn turns out to be part of a longer term economic, market, customer or competitive event then significant business issues will ensue. I have long been an advocate of the axiom: The best way to generate a good bottom line is to start with a good top line. This only makes sense. The more good revenue you have, the easier it is to generate good earnings. Good revenue is defined as revenue that includes a business sustaining profit margin. However if revenue has fallen, and the cost structure has not followed suit, then earnings too must eventually fall. Senior management, the market analysts and the stock market in general do not like it when earnings fall in a company. Like the sales and the earnings, the price of the stock will also fall. Soon the investors and stock holders will request that senior management take action to improve their investment’s stock price, or they will request that they get a new senior management team. When sales are stagnant and costs are relatively high with respect to sales, there are usually two paths that management can choose from in trying to rectify the situation. They can try and cut costs in order to resize the business to be more in line with the new revenue levels and hence generate a reasonable profit on the new lower revenue levels; or they can try and embark on a growth strategy in order to drive the revenue levels back up to where the desired earnings can be generated with the current cost structure. Several factors can influence which path management may decide to take. Is there a cyclic nature to the sales profile where downturns and following upturns are common? How deep is the downturn? How prolonged is it? Is it industry wide? Is it part of a greater economic event? The answers to all of these questions, and many others can influence management’s decisions and responses to the reduced sales levels. The general response to a sales downturn is to refocus on sales, but also to begin reducing costs. While layoffs are painful and take their toll on both the employees and the company, they do invariably succeed in resizing the company’s cost structure to be more in line with its current revenue levels. This is cold. This is hard. It is also the truth. If we are to assume that the company must survive in the face of a prolonged reduction in sales, then this is in general the selected way to assure that a business is moved back into a profitable state as quickly as possible. Focusing on sales while reducing costs will eventually generate the earnings that a company needs for continued operation. However some businesses decide that they may not want to adjust their cost structures in response to a downturn in sales. There can be any number of reasons for this. They may decide that the downturn is only seasonal, or will not be prolonged and sales will recover. They may decide that they were understaffed prior to the downturn and hence are right sized for the reduced sales levels. They may be culturally averse to the separating of employees. Regardless, they may choose to embark on a sales growth strategy as the solution to a sales downturn and the accompanying earnings and profitability issues. While sales growth strategies are laudable approaches to a reduced revenue / high cost base issue, for the most part they generally prove unsuccessful. This again is directly due to the fact that sales levels have already fallen. Something must be changed in order to get sales levels to increase. This new event can take the form of adding additional sales personnel to address and sell to a larger number of customers, modifying the product offering to make it more appealing to the market, increasing marketing programs and promotions in an effort to generate more demand in the market, or a number of other modifications to the business equation. The point here is that all of these and many of the other sales improvement modifications require that incremental investment and cost be put into the business in an effort to drive more sales out of it. Adding sales people, modifying or redeveloping the product, creating and implementing marketing programs and promotions, reducing prices, etc all take incremental investment and increase costs. That means that even if you were successful and found a way to drive sales back up to the previous levels where they sustained the previous cost levels, the very act of driving the sales back up increased the cost basis. That means that you cannot be satisfied with just getting back to the sales levels you were at, in order to maintain the desired profitability levels, you must drive sales to levels above their previous amounts. This too could be a good plan except for the fact that the market like nature, abhors a vacuum. There are relatively few “green field” opportunities where growth and market share can easily be obtained. Unless the overall size of the market is growing, it usually means that new business must be taken at the expense of another market competitor. Obviously no one likes to lose customers and market share. Market research has shown that in general it is five times easier to sell to existing customers than it is to sell to anyone else. This makes sense as you would suspect that if a customer has already made a buying decision in your favor in the past, that they would probably be disposed to make a similar decision in the future. But in a market growth strategy you are not only trying to sell more to existing customers, you are trying to sell to new customers. Someone else’s customers. Logic would show that if it is five times easier to sell to your own customers that it would be five times more difficult to sell to someone else’s customers. This logic does not bode well for a growth strategy. Sales and business growth are always part of the objectives of any business. Sometimes however, businesses fall short of their sales and growth objectives. This can and does happen in even the most stable of markets. Leaders must actively recognize and anticipate what is occurring. If the change is cyclical or just an aberration, then normal business processes should continue. If it is judged that there are other forces in the market affecting sales and that recovery is not imminent or expected of its own accord, than action must be taken. As always, the sooner that action can be taken, the less severe it usually needs to be. Increased sales focus or cost reduction activities taken in March or April will avoid the desperation and severity of actions that must be taken later in the year. Regardless of when actions are taken, the costs associated with a business must be in line with the profitability objectives and existing sales volumes of the business. To focus on just the growth component of business solution (or just the cost component for that matter) would be similar to trying to adjust both the volume and the tuning of your car’s radio by turning just one dial. I have come to find out that in his own autobiography Twain attributed this quote to a nineteenth century British statesman and former Prime Minister Benjamin Disraeli. This fact perplexed me slightly so I continued my research a little further using those modern bastions of all knowledge, Google and Wikipedia. After an exhaustive five minute search I found that the general consensus is that no one knows for certain who the author of one of my favorite quotes is. This fact will make it reasonably difficult to give attribution in the future should the opportunity to use it come up again. Be that as it may, it may be time for me to take the slightest exception with one of my favorite quotes. When you are looking at the performance of a business, the numbers don’t lie. Now the way the numbers are arranged can sometimes be confusing or even misleading, so the business leader needs to be aware and careful. I don’t say this too loud or too often, but I think I may understand numbers reasonably well. Physics, Mathematics, Finance, I have studied them all. And believe it or not, to one extent or another they are all numbers based disciplines. In addition to this degreed book learning, I have had what could almost be called a moderately useful stint of practical numerical application in the business world. I sometimes use this unbridled numerical capability and familiarity to complete the most difficult of Sudoku number puzzles in the USA Today newspaper, or various in flight airline magazines. Just to stay in practice and make sure that I still “have it”. Okay, enough quotation roulette. I hope you get my point, whatever it was. Now back to the topic; in the business world, the proper statistics, when properly presented and interpreted are invariably a good indicator of business performance. That is correct. Statistics, which are the indicators associated with past performance, are usually good indicators of future performance. I understand that Mark Twain, Benjamin Disraeli and whoever actually created one of my favorite quotes regarding statistics are all probably collectively grumbling, wherever they are, but this is the case. When we have the choice of making an investment, or are reviewing the continuation of an existing investment, which investment alternatives do we choose: those that have done well in the past, or those that have done poorly in the past? All things being equal, and pursuing an intelligent risk diversification portfolio, understanding long term investment return and interest rates, blah, blah, blah…..we almost always pick the one that has done well in the past expecting (hoping) that all things being equal it will continue to exhibit the same performance traits going forward. We very rarely select the one that has been performing relatively poorly expecting (hoping) that it is going to turn around. Why do you suppose that is? Welcome to the world of statistics. You have taken the data points associated with performance in the past, extrapolated the line or curve forward and made a choice and prediction about the future. Statistically speaking that is probably the correct choice. But this isn’t a discussion about investments. It is a discussion about business. And the same exact concepts apply. The author of this quote also appears to be shrouded in the past as well, but like all the other good quotes of the period, it was attributed to Twain. Let’s look at a simple statistical example to make my point. Let’s say that in the next measurement period (it doesn’t matter how long the period is) that a business sells one more product unit than it did the previous measurement period. This is good right? Basically the answer is “yes” selling more, any more is usually always good, but how good? If it is your first measurement period in business, it’s hard to say how good without more data (statistics). If you only sold one unit the last period, and then you sell two units this period, that is sales growth, but it is still difficult to evaluate without more data. If you sold a thousand units last period, then one more this period might not be statistically important. On the other hand all of those responses could be changed depending on the cost and value of the product being sold. If you are selling nuclear power plants as opposed to canned hams, a single unit growth in sales could be seen as spectacular, whereas the sale of a single additional canned ham might not be a cause for much celebration. Statistically speaking selling one more than nothing is infinite sales growth but it is still only one unit. Selling one more than one is one hundred percent growth, but it is still only two units. Selling one more than one thousand is only one tenth of a percent growth. All represent the same one unit growth, but can be represented significantly differently in the statistical growth example. The wary leader needs to always be aware of how statistics are being used and the story that is trying to be portrayed. Again, when using data and statistics unless a business can specifically quantify what changes it is going to make and how those changes are going to be translated into performance, like your investment decisions discussed earlier, you would expect the business to perform very much in the future as it is doing today. It is through this process that the market valuates companies, and it is through this process that companies provide their future forecasts of performance. Leaders always need to be aware that statistics are extensions of the data. They are the way that the data is being presented and interpreted. The data is the fact. It is the consistency of the statistic, the interpretation of the data that is the key. Understanding the underlying numbers, and the analysis and statistics associated with them is required and essential for the successful leadership of the business. To not be able to do so is to be at the mercy of those that do. Who is that guy standing around with the musicians? I know this joke because I am a bass player; or rather I try to be a bass player. I took many years of lessons. I have studied, understand and appreciate much of music theory. I practice. I am committed. I have worked to try and turn myself into a serviceable bass player. I enjoy all of it. There is only one thing holding me back from being a truly outstanding bass player. I have only a modicum of musical talent. I understand this, and it doesn’t bother me a bit. I love to play. It just makes me want to work at it that much harder. I take what I have and try to get the most I can out of it. Whether it is rehearsing with the band or playing on stage at the last jazz festival, I really like doing what I am doing. The challenge to perform is always there. I have seen real musicians. Those with real talent. Their ability to learn, play and adapt to the music is amazing. The ease with which they play and perform is amazing. If at all possible, I always try to be in organizations (bands) where I am challenged to play and perform with those that are more talented than I am. Playing with musicians that are more talented than I am has made me in turn a better musician as well. I once asked the leader of one of those bands that I played in why he selected me as the bassist when there were other bassists with more talent available to him. His response has stuck with me. He said that sometimes it wasn’t all about talent. There also had to be a commitment and that sometimes the level of commitment could outweigh the level of talent. He said not to get him wrong and that there had to be a reasonable level of talent and ability, but those that work hard and are committed can also perform to very high levels in the right environment. He was looking at the overall sound, arrangement and structure of the band, not just the talent level of each of the members. I was very pleased to hear this as it gave me additional impetus to continue to work hard, and practice in the effort to improve. So what does this story about my musical aspirations and talent level have to do with business? I think it points out that there are multiple dimensions to the structure of a business team, just as there are to a musical combo. While talent and aptitude are key components of each team member’s makeup, there are others, such as commitment, that come into play when assessing the team. This band leader had recognized that there was both a minimum acceptable talent level he was looking for and a commitment level that he wanted. Once we had all demonstrated that we all had the requisite skill levels, with some having more than others, it became a question of other less definable considerations to be associated with the selection process. When you think about it, business operates in much the same way. A while ago I noted how many of the military leaders throughout our history were not necessarily identified as the most talented or smartest members of their respective military training academies. Yet somehow they advanced to the highest levels of their selected disciplines ahead of those that were at least initially more highly regarded and supposedly more talented. Again all of them obviously had the requisite skill levels, but it was something else that enabled those with supposedly less talent to advance. I am also a professional hockey fan. I was not particularly a hockey fan when I was younger, but have become much more so a fan as I have grown to understand the game. I now regard the game as an elegant combination of speed and skill where those that may not be genetically selected specifically because of their height or size (as in some other professional sports) can compete. I just recently read an article written by a hockey scout on what they look for when they are scouting young hockey players as potential draft choices or future professional hockey players. Again some level of talent is always a minimum required baseline, but what they said they looked for in a hockey prospect was what they called the “compete level”. How hard did the skate? How hard did they work? How hard did they battle in competitive situations? Did they take it easy sometimes or did they play hard all the time? This again sounded suspiciously like assessing their commitment level. They wanted to know if the prospect was getting by on just their talent level or did they also try to outwork the competition? Having the talent and ability to succeed does not necessarily mean you have the desire to compete at such a level in order to succeed. When the time comes and you face a competitor with a similar talent level it will be some other factor, such as commitment that will decide the outcome. Business, sports and even music are all competitive structures. As you progress through each of them there is a continual selection process that goes on. The further you go, the higher the talent level of all participants, and it becomes something else that separates the participants. In music you start out at the very lowest levels as a beginner. You take lessons and work at it and practice. If you have talent, stay with it and play well enough you can get to play at amateur and even professional levels. It can be a lot of fun. It is for me at least. It is the rare talent that gets combined with the proper level of high commitment that makes music that is played on the radio, or gets to play for the large paying audiences. In hockey you start out in the minor leagues or in schools, and again it is the rare combination of talent and “compete level” that get combined that enable the player to progress through the various levels of minor leagues and make it to the highest levels of professional hockey. It is interesting in that there are players in the league that are recognized for their talent levels, and there are players that are recognized for their compete level, and there are very, very few that are recognized for both. In business the progression from entry level to business leader also has several different levels of responsibility that you must pass through. At each level there is an almost requisite talent level that all participants must have, otherwise they would not be there. It is here that their commitment or “compete level” will begin to differentiate them. Can they get the job done? Do they get the job done? Why or why not? It has been my experience that much of this commitment level manifests itself in the level of preparation that an individual brings to their assignment. Have they done the preparatory work? Can they anticipate and prepare an answer to the questions that they will invariably be asked? As I have noted in the past, I see several parallels between music and business. In music my commitment level drives me to practice rehearse and prepare so that when the time comes to step on the stage in front of an audience, I can be confident in my performance. In business it is the preparation and ground work that are the manifestation of this type of commitment. Anyone can step to the front of the room and present slides to the audience, but it is those that are committed that have taken the time to understand and anticipate the questions and the next steps that are confident in their performance. Despite all the practice and preparation, I still get a little nervous every time I go up in front of an audience. I don’t suspect that I will ever lose that. Is Phil Mickelson Ruining Business? I was watching the U.S. Open golf tournament the other day. I enjoy doing that because it gives me the chance to watch people who really know how to do their job which in this case is to play golf. Believe it or not I think I actually learn a little when I watch them as well. Not much, just a little. I feel the only thing that truly separates me from them is talent. They have it and I don’t. That and age, and flexibility, and focus, and drive and probably a few other traits that I am not currently aware of. What I noticed about this broadcast was that they seemed to focus on the players’ recovery shots. The course was set up so that if you weren’t in the fairway you were in trouble. What I saw was a lot of miraculous recovery shots that were attempted from this trouble, and only a select few that were successfully executed. However, the guy who eventually won didn’t seem to attempt the miraculous on every shot. Truthfully he was probably not in trouble as often as the others, but when he was, sometimes instead of attempting the miraculous he just chipped out. He then tried to put the ball on the green and make a putt to save par. He did that a lot. The other guys didn’t. He won by like eight strokes, which in golf terms is the same as lapping the field, or a knockout. Let’s get this straight right up front. Phil Mickelson is an amazing golfer. He has won forty two events on the PGA tour. He has won five major championships. He has spent over seven hundred weeks in the top ten of the world’s golf rankings. I cannot hit my driver as far as he hits his six iron, maybe even his seven iron if he decides to hit it hard. He is a crowd favorite everywhere he goes because of his demeanor on the course and his willingness to interact with the fans. So why do I think that he is ruining business? I think of him as the father of the miraculous recovery golf shot. He makes a lot of them and they are all highlight reel material. When we see what we think of as an “everyman” like Phil Mickelson pull off the miraculous recovery, we think we can all do it, and not just in golf. We are now getting close to the point. Phil Mickelson will hit some of the most incredible shots in golf that will end up getting him into some of the deepest trouble possible on a golf course. He has been known to get a little wild, or to make some foolish decisions at the most inopportune times imaginable. What is amazing about him is that he can then hit some of the most amazing recovery shots humanly possible and put himself right back in the game again. Notice that I said he “can” hit amazing recovery shots. That doesn’t mean that he always does. Sometimes it works and he is almost unbeatable. Many times it doesn’t, and then things only get worse. Golf, like business is very unforgiving of compounded mistakes. While it is true that he has won so many times on tour, what is not so widely publicized is the number of times that he lost when he should have or could have won, due to the erratic nature of how he plays the game of golf. In 2006 Phil Mickelson lost the U.S Open on the seventy second and last hole. He came to it leading by one and needing only a par to win. It was not an especially long hole, but as with all major championships it was not easy. Instead of being a little conservative, and probably winning or at worst tying, he went for it as he always does. He teed off and knocked his drive into the trees. Instead of playing it safe and smart (as this year’s U.S. Open winner did on several occasions), and pitching out to the fairway where he could then rely on his well documented and much acclaimed pitching and putting skills to get his par, he went for the fabulous recovery shot. Mere mortals could not have hit the shot he was going to try and hit. He was going to bend a shot around some trees and knock it on the green from more than two hundred yards away. It didn’t work. He hit another tree and the ball came rolling back toward him. Now he is laying two, and he needs a four to win or a five to at least tie, and he is no better off than he was before. He goes for it again because now he has to. This time he gets it around the trees, but misses the green and it ends up in a difficult lie in the greenside bunker. Now he needs to get it out of the bunker and in the hole in two shots just to tie. He gets it out of the bunker, but misses the putt to tie and just like that he loses the tournament. While Phil Mickelson is renowned for his miraculous recovery shots, there will always be the question of should he have avoided the trouble in the first place. Could he have played it smart and not hit his sometimes erratic driver, opting for a club that he could have more easily used to hit the fairway? Once in the woods could he have made a better choice that would have taken losing the tournament outright out of the equation, while still giving him the chance to win? Mistakes in golf, like in business can always happen, and when you do find yourself in trouble is it always the best course of action to go for broke on the recovery? History has shown that most attempts at miraculous recovery shots fail, otherwise it would not be considered so miraculous when they succeeded. If they always succeeded they would just be recovery shots, not miraculous recovery shots. Too many times it seems that businesses can find themselves in a difficult situation and instead of playing to their own strengths and capabilities, play for the miraculous recovery. Most of the time when they try the go for broke recovery in business, the business does indeed go broke. There are examples of successes using this approach. They usually end up in some business school case study where they are captured and passed down to future generations. I think they are more like lightning strikes in a rain storm. They are relatively rare, individual events, and as the saying goes lightning doesn’t usually strike twice in the same place. Actually in golf getting struck by lightning even once is not considered a good thing. That’s normally why we go inside when it starts to rain. Getting struck by lightning of a golf course will usually ruin your round, and probably any future rounds you had ever planned on playing. In golf a steady performer is known as a “grinder”. A grinder is someone who works at minimizing their mistakes and maximizing their opportunities. A grinder usually doesn’t have less talent; they usually just don’t take as many risks. When a grinder makes a mistake or does find themselves in a difficult position, they weigh all the risks and rewards with an eye toward realistically minimizing the downside risk. They understand that they may not be able to win the tournament with a good decision, but that they can certainly lose it with a bad one. Making par after a mistake is not a bad score. t or another as grinders also. This means that the riskier, more swashbuckling approach to golf that Phil Mickelson so successfully uses is much more the exception than the rule for the truly successful. Miraculous recoveries are attention grabbing by their very nature. Few of the attempts are really ever successful despite the numbers that are tried. Those that are successful however are very widely reported and seem to take on an image and a life all their own. Miraculous recovery attempts seem to have become the standard against which we want to measure all performances, be it in golf or in business. A business that finds itself challenged might better learn from this year’s U.S Open winner. He calculated when to go for the miraculous, and when to play it smart and just chip out of trouble and play on. Phil Mickelson has finished second six times in the U.S. Open indicating he definitely has the talent and capability, but has never won. This year he was sixteen shots back. Businesses are also always competing and need to understand that while the miraculous is usually widely reported, that by its very nature cannot be expected to regularly occur. Setting realistic goals for each shot a business is going to take is a key to a business’s ongoing success. It’s better to leave the miraculous recovery shots to the golfers.